Since its founding in 1965 Special Collections has participated in documenting California history and has assembled collections of regional historical materials with a unique focus on the achievements of Santa Cruz County and the City of Santa Cruz. Its collections of pre-statehood documents, scrapbooks and clipping files, photographs and photo albums taken and compiled by local residents and professional studio photographers, and publications by local authors and institutions make Special Collections a major research site for the study of Santa Cruz history and Santa Cruziana artifacts. Among its most important collections are the papers of pioneer families such as the Porter Family, the collections of Preston Sawyer, and the papers of contemporary political figures such as Santa Cruz supervisor Hulda McLean and State Senator Henry Mello. Leon Rowland Research Collection: Materials from the research collection of Leon Rowland (1884-1952) local historian and editor of the Santa Cruz Evening News and the Santa Cruz Sentinel. Includes a searchable database of the Leon and Jeannette Rowland File Card Index. Oral Histories of the University Library Regional History Project: Oral histories of important regional figures from business, the arts, government, public service, and UCSC. Santa Cruz County History Digital Collection: Digitized photographs of Santa Cruz County from the Abbott Slide Collection and the Hitchcock Photograph Catalogue. 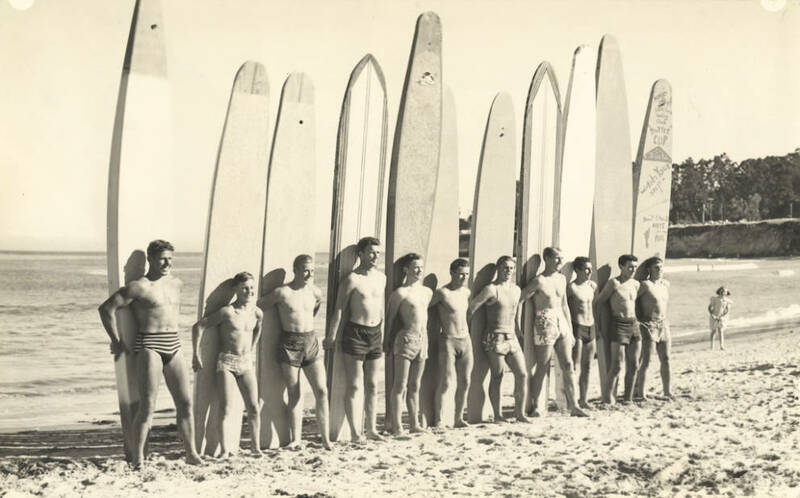 Image: Club surfers standing in front of surfboards: Don Patterson, Harry Murray, Rich Thompson, Alex Hokamp, Blake Turner, Bill Grace, Dave (Buster) Steward, Fred Hunt, Harry Mayo, Pinky Pedemonte, Tommy Roussel at Cowell Beach. Harry Mayo Surfing Photography Collection. Special Collections and Archives, University Library, University of California, Santa Cruz.